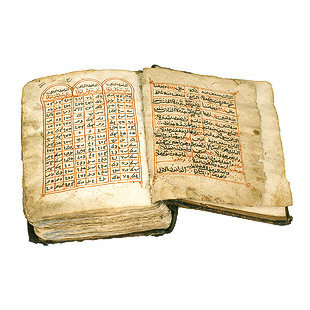 This book contains the four Gospels in two columns and the Dallal of the Coptic year seasons. This book is written in Arabic, contains 258 pages each with 15 lines per page, and is covered in hard paper. It starts with a colored bench. The titles of subjects are in red ink. The numbers of pages are in Coptic. The Dallal is plaited and decorated with red ink. Each paper has 402 colophons and is included either in the beginning, middle, or at the end of the book. The colophons contain the name of the inscriber, the interested person, the donor, the place to which it is presented "waqf," and the year of inscription.